Ariston is known to be one of the leading water heater brands in Singapore. Pioneering in their state-of-the-art technologies in water heaters, Ariston has launched Singapore's first Constant Temperature technology in its AURES instant water heater range in 2016 and Singapore's first SLIM storage water heater in 2017. During the official launch event held at the Maison Gallery, Ariston has proudly announced its whole new technology in storage water heaters through the Ariston Andris2 range. 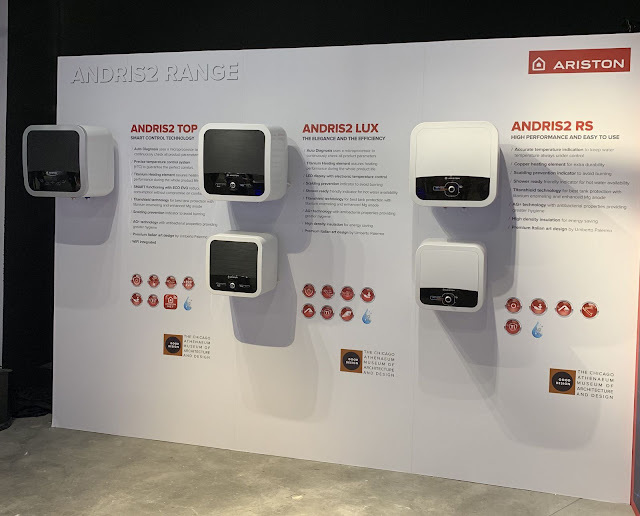 This new range of Andris2 storage water heaters are equipped with revolutionary smart technology, a renewed luxury design and a patented titanium heating element. The Andris2 range includes the models Andris2 Top, Andris2 Lux, and Andris2 RS. The opening speech was given by Mr. Vito Saracino, Managing Director of Ariston Asia Pacific. As the leader of the Ariston Thermo Group in this region, Mr Vito is here to share with us insights about how Ariston Thermo has managed to maintain it's position as the market leader in the entire APAC region, as well as the Group's direction for the year. "As global leader in water heating Ariston well understands customer's desire for durability, safety, energy saving and design." said Mr. Vito. "The Andris2 range is a unique synthesis of all this. Furthermore, the versions with smart technology and Wi-Fi features bring the shower comfort to a level that no other water heater in the world can reach. We are proud of this small masterpiece, result of years of experience and hard work by Ariston engineers and Italian designers". Next, Mr. Eddie Lee, Country Manager for Singapore came up to share on the different partnership that Ariston had and also the events like the Annual water day. Lastly, we had Mr. Francesco Bugliosi, Marketing Manager for Asia Pacific who shared with us a video on The Ariston Comfort Challenge. it's really incredible to learn that the team went all the way to Greenland to bring the comfort of a hot shower where it seems impossible in that kind of extreme cold weather. 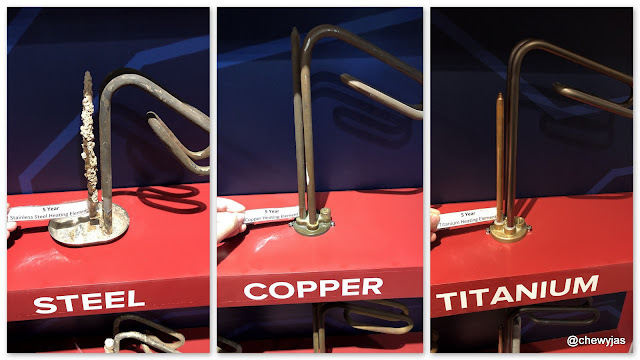 Let's see a photo of that is made of different heating element after 1 year, after 5 years and after 10 years. Clearly, Titanium is the only one material that can last through time and Arison has always pride itself to develop durable products thus they were the first water heater manufacturer to use titanium against water corrosion. In fact, all of Andris2 models are made with super-ecologic insulation materials and patented full-titanium heating element which assures top heating performance during the whole product life. To prove product durability, this unique component in Andris2 Top & Lux range comes complete with a lifetime warranty. Now, we take a look at the cutting edge Italian design by renowned art designer Umberto Palermo. This sleek and minimalistic design with beautiful, clean and modern lines is possibly the best-looking water heaters out there. Furthermore, it is so slim that it does not take up too much space in the bathroom and thus means a less cluttered and a more spacious bathroom. As everything is moving towards the smart technology, even the water heater now comes with a new Smart Control Technology. 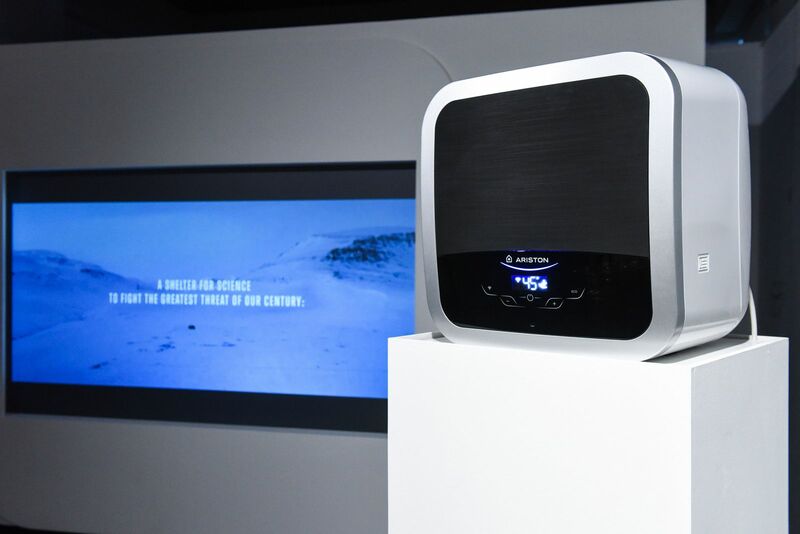 The premium Andris2 Top model is the first WiFi-enabled storage water heater in Singapore with dedicated app controls. Using the Aqua Ariston Net App, you have total control of connecting with your Andris2 Top smart water heater. Get shower-ready notifications sent to your mobile for hot water so you do not have to wait and turn on the water for a few minutes before it gets hot. You can also find information on the next available shower timing, receive information about water temperature and energy consumption reports. With the app, you can also turn the product on and off or set a weekly schedule to have hot water only when necessary. 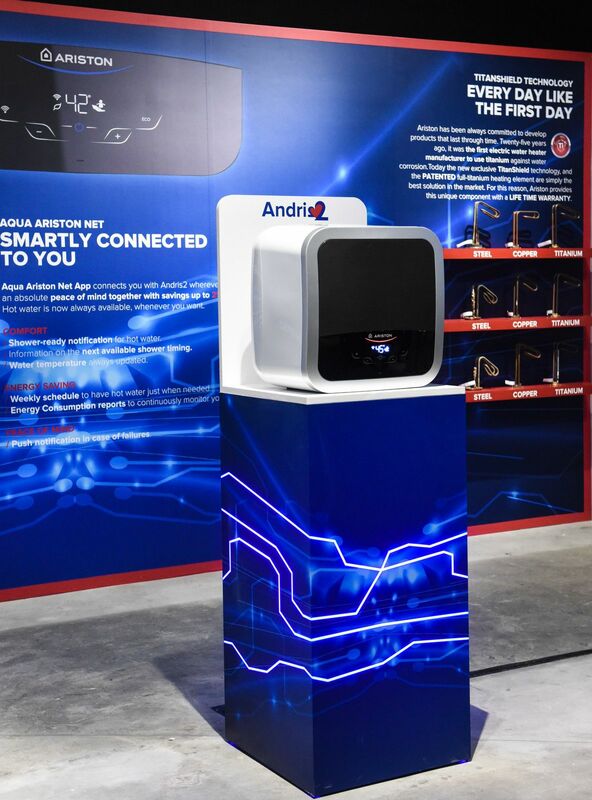 There is also an integrated auto-learning software ECO EVO that was being installed in the Andris2 Top that will learns your shower habit day after day and is able to recall your daily habits to deliver hot water right when you need it. ECO EVO is the most innovative energy saving algorithm used worldwide by Ariston to reach the top energy ratings. In fact, based on the Estimated savings on daily basis after a comparison to Ariston standard mechanical product, this can save up to 25%. Beside the water heater that were on display, the place was also decorated with Artiston theme. Look at this backdrop that was specially created in their logo. Thanks Michelle for helping me with this photo! I was even more amazed when I found out that this this piece of painting created by Chef Janice Wong is made from Chocolate, Gummy and Water. It is painted in gummy and different shades of blue to represent the textures of water. 200 chocolate circles were cut out to form a rainfall of chocolates. 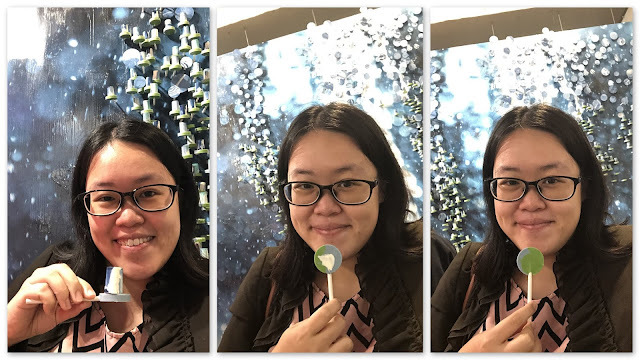 300 chocolate lollipops were sticked on to hold 300 chocolate Bon Bons that are specially crafted with 3 special flavours - Chocolate and water, Sea Salt Dark Chocolate and Coconut White Coconut. I simple love it and really admires her piece of culinary art work. Makes a super cool backdrop for selfie after eating too. Lunch time to me is very precious as it's not only just a break from work to eat but also the time I used to catch up with friends as my evening time is usually spent with my girl. Once again, I'm back here at Little Sheep Hotpot and this time they had introduced a new promotion for their value set lunch! The first time I am here was for their opening launch event and you can read more from the blog post here. Getting to the restaurant is not a problem as it's just a short stroll away from the raffles place MRT. I could even enjoy the scenery while walking to the place. This was the scenery I had as I walked from my office and back again. I was the first to reached and the friendly staff there was quick to greet and usher me to an empty table. However, after some clarifications, we realised that the host had actually reserved a private dining room for us. I was pleasantly surprised to find the table ready and set up when I was lead into their private room. Previously during their opening launch, we had a big crowd and were seated at the main area thus I didn't even know they actually have a private room like this. With just the few of us, the ambience of the private room was great and privacy gave us a cozy and warm feeling while we enjoy the food. When everyone had reached and settled down, we ordered our individual soup base through the iPad. It was priced starting from $8 a pot, depending on which soup base you choose. For me, I ordered their half signature clear soup and half mala soup to get the best taste of both flavours. The taste of the soup was further enhanced once the hotpot ingredients were added. It came with free refill too and the staff were attentive enough to top up the soup for us. Little Sheep Hotpot had gained a reputation for hot pot without dipping sauce as their broth base are rich enough with an assortment of fresh ingredients such as goji berries, jujubes, black cardamon pod, ginseng and herbs. However, if you would like to enjoy their unlimited condiments, sauces, fruits and desserts, you just need to top up an additional of $5. We were served with the different choices of meat and you can tell the meat were fresh and not frozen. Perfect slices of meat. Other than the meat, the hotpot ingredients had a good mix of greens which looked presentable and neat in this 3-tier rack. It was more than enough to last us throughout the 2 hour session. Also, since all the ingredient shown was part of the set lunch and was served together, I did not have to waste the time to order additional ingredients. Instead, I spent the time to enjoy chatting with my friends while cooking my meal. and continues the legend of the Little Sheep Hot Pot.
. 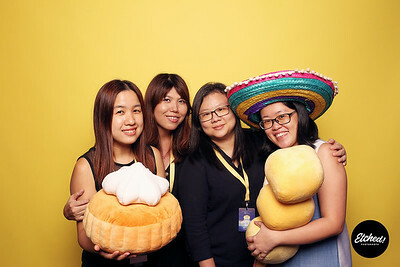 I really enjoyed the company of Meryl and Jessie, my two blogger friends. We enjoyed our food and also the nice catch up. Do head down before their lunch promotion ends. - 18 hot pot ingredients (Spinach, Luncheon Meat, Bean curd, Fish Tofu, Meat Ball, Beef Ball, Mushroom, Fried Beancurd Skin, Dumpling, Cabbage, Rice Vermicelli, Corn, Black Fungus, Potato, Yam , Crown Daisy, Lotus Root and Noodle). Terms and Conditions: Set lunch does not includes soup bases and sauces. Valid for dine-in at the stated time period only. It was a night to remember as The Working Capitol celebrates its 4th anniversary in style. Located at 1 Keong Saik Road, the place was merely a short walking distance from Outram MRT station. I met up with Jane and we were greeted by a Flea Market preview hosted by one of their partners at the first floor entrance. We proceed on to the lounge area at the second floor for our registration and goodie bag where we found items that incite a nostalgic vibe such as the Donkey playing cards and the spring toy which my girl finds it so amusing. 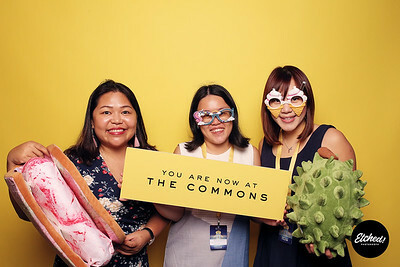 The actual party was held on another level up at The Commons which is an event space that is often used for celebrations by various other companies and organisations. The party kicks off at exactly 1920 hrs, commemorating the era in which the flagship at 1 Keong Saik was built. 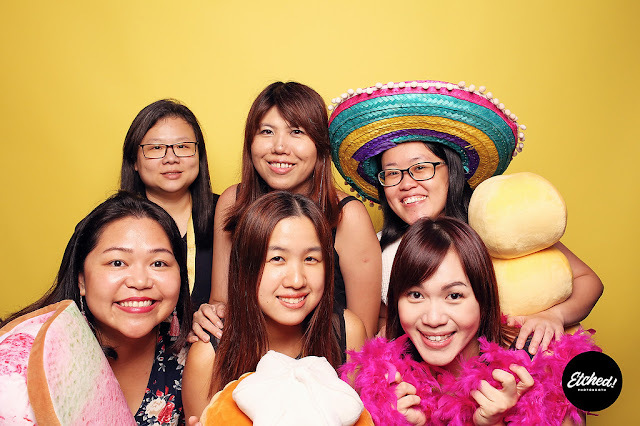 The theme of the party was 'Time' and along with celebrating the past, present and the future of The Working Capital, we were treated to some great Singaporean dishes. The Nasi Lemak from The Coconut Club is one such dish and there is also a self service Kachang Puteh Bar, perfect for some free flow nuts to bring back the memories of our yesteryears. We were also given a drink coupon that we can use to redeem one drink out of the four specially curated cocktails by Bula Global Trade, the liquor distributors as well as their new partners taking over the 1KS Cafe and Beer Garden. I chose the Curried Sourz but in the end I prefer Jane's Gin Chryst. These 4 cocktails were meant to tell a story of their journey at The Working Capitol and how they have grown over the years. Taking the mandatory group photos at the photo booth to bring back for memories. It was kind of challenging when we took the six people photo as there is no preview on the screen but we finally managed with this nice shot after a few tries. Dee found the little art area set out at the balcony. So, Dee, Jane and myself, we went to try out hands at painting our own tiles with the idea revolving around our dreams. My Arts really stays at Primary School level but my dream is really that simple, to be happy. What makes me happy is really just time spent with my loved ones. 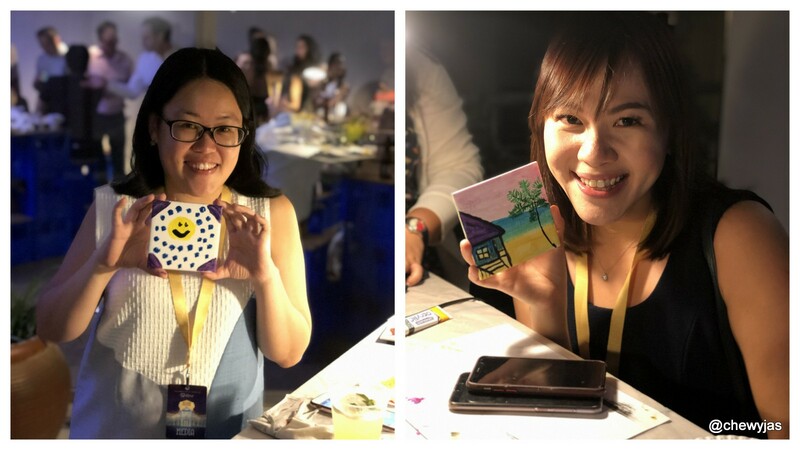 These painted tiles will be immortalised as a mural on the exterior facade of The Working Capitol together with the artwork of visual artist MaryAnn Loo (@penguingirl_art). 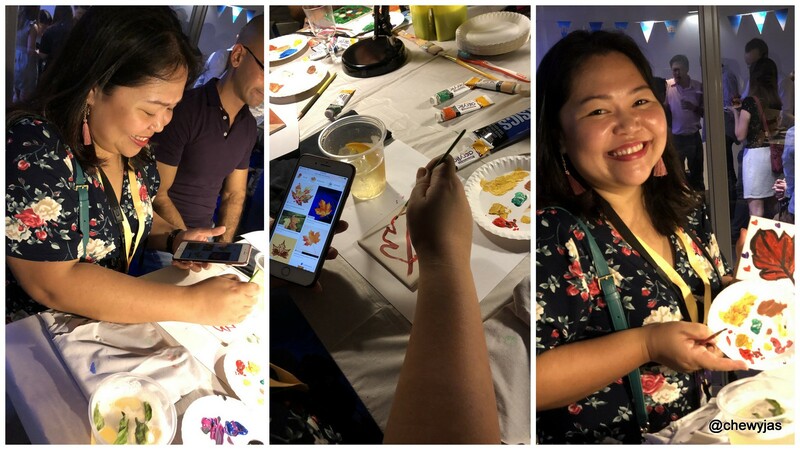 During the later part of the night, a silent auction featuring a handful of items such as antique centrepieces, staycations and more were held. However, due to the excitement of everyone, it was not much of a "silent" auction. The proceeds of over two thousand dollars gathered from this Silent Auction all goes to their beneficiary at Daughters of Tomorrow. It was interesting to explore and learn how The Working Capitol is redefining the way people work. It is not only just a coworking space but also a lifestyle provider with its own cafe and beer garden. It offers a range of workspace solutions suited for entrepreneurs and small business with private offices, meeting rooms and event hall. Community programmes and events are also held for networking purposes. Thank you for the Media Invite! Spanning five light-filled, historic shophouses, The Working Capitol on Keong Saik houses companies ranging from startups to multinationals. 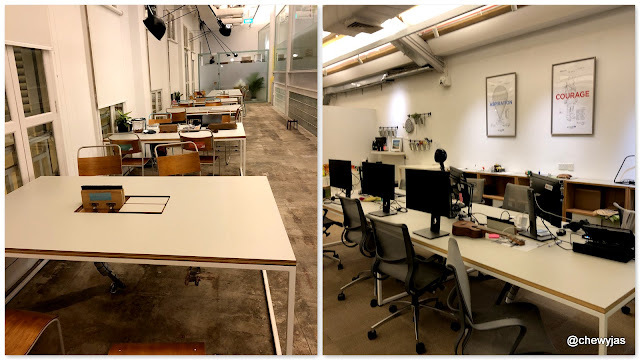 Productivity, buzz, and community are the words we most often hear used to describe the atmosphere in the space. 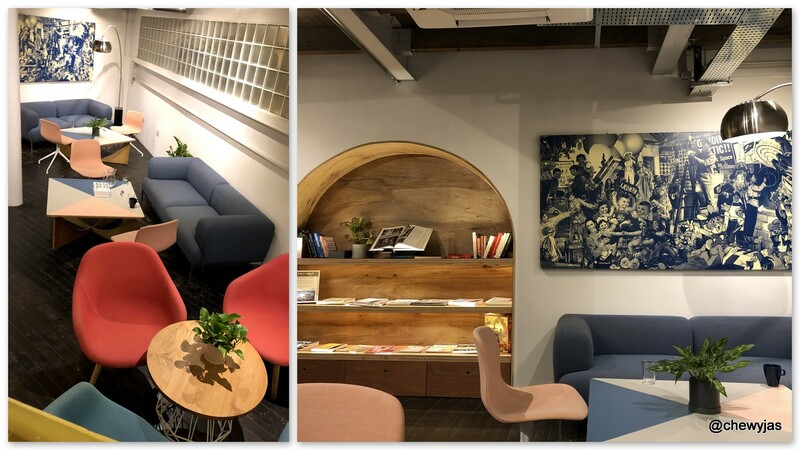 The Keong Saik Road location's spacious 33,000-square-foot interior includes multiple event spaces for up to 200 people, a beer gardens for after-work socializing, and three attached restaurants, ready to host client luncheons and team happy hours.